Salads are only worth eating if they’re going to fill you up and make you feel amazing. 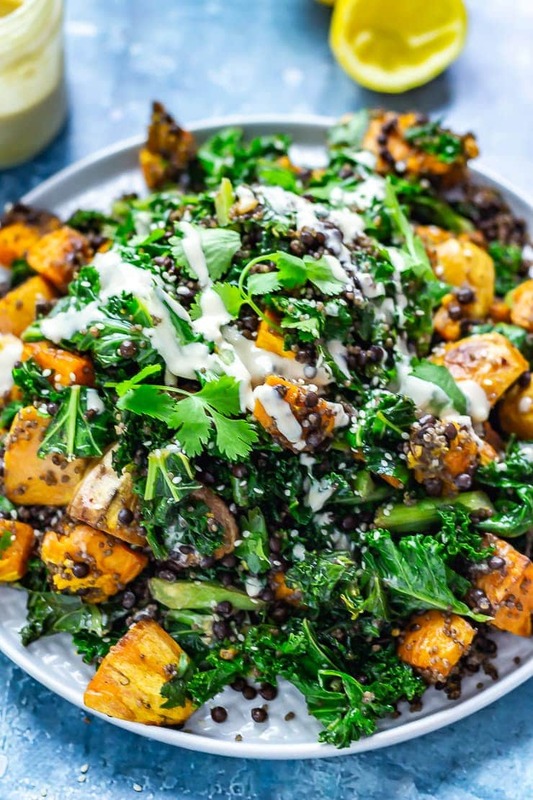 This sweet potato and quinoa salad does exactly that. Drizzle with a good helping of creamy sesame dressing and you’ve got a perfect lunch or dinner. I am loving the summer salads right now. It makes me so happy when I eat a salad that makes me feel full and puts a smile on my face. So far this summer I’ve been obsessing over this super simple pasta salad with an incredible balsamic dressing and this smoky aubergine salad but those two might just be about to be overtaken by this filling, healthy and vibrant salad. I can only eat salads that are mainly carbs and dressings. I mean I could eat the mainly leafy ones if I really had to but ideally I want ones that fill me up for hours and taste amaaaazing. No more boring salads! As much as I’m normally a carbs and cheese kinda gal I do have a tendency towards craving salads as soon as the weather gets warm. And it has been warm recently although it’s been storms and rain today, British weather…go figure. Storms in the UK are mostly like all other weather in the UK, half-hearted and unremarkable but for once the storms in London have been pretty epic. I can’t remember the last time I saw full on bolts of lightening across the sky here but that’s what we were getting on Saturday night and I find it all pretty exciting. Stormy weather aside though it’s been pretty pleasant and I’ve got fingers firmly crossed for a hot and beautiful summer full of fun outdoor activities (and by this I obviously mean barbecues, picnics and drinking in beer gardens) and delicious summer salads. 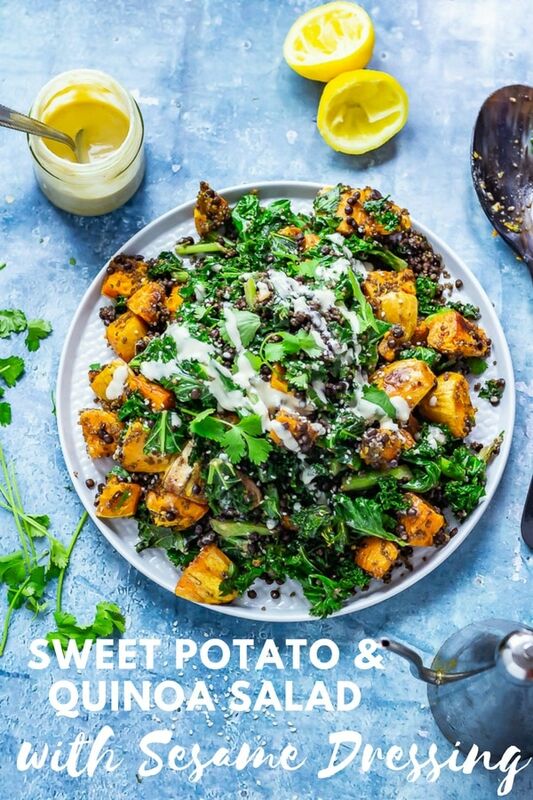 So this sweet potato and quinoa salad then. My approach to salad is basically like one of those games you play as a kid where each person draws a body part and folds the page over until you end up with a full drawing of a person. I take a random selection of all my favourite ingredients and throw them all into a bowl until you get what I loosely call a salad. 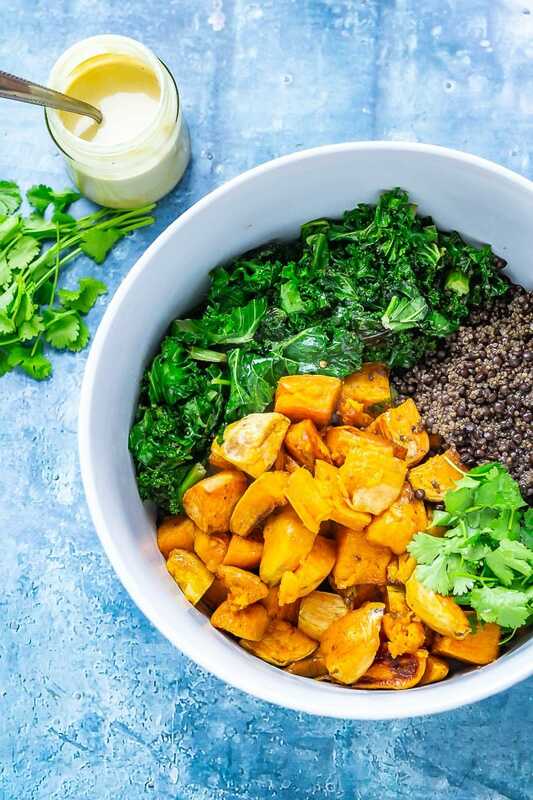 Now once you’ve got all your yummy salad ingredients tossed together in a bowl you’re going to need plenty of dressing to tie everything together. I made a sesame dressing which I honestly could eat with a spoon. I strongly advocate for you making double this dressing recipe and storing the rest in the fridge to dip everything else you’re eating in it for the rest of time. It’s nutty and sweet and garlicky and just fills me with joy in the way only food can. It really is that simple. Measure out each ingredient into a jar, pop the lid on and give it a good shake (or whisk thoroughly in a bowl) and you are ready to go. I like to put everything in a big bowl and then drizzle on a few tablespoons of dressing. 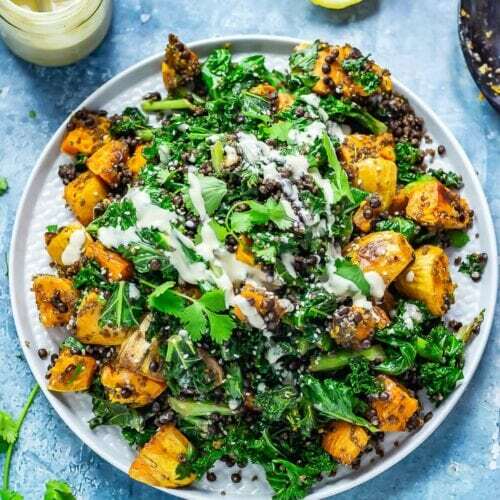 Toss gently (and I mean gently because roasted sweet potato has a cheeky tendency to mush if you toss too hard) with the dressing so that everything is coated in a thin layer and all the ingredients are mixed thoroughly. Once I’ve tossed I then tip everything onto a serving platter with another good drizzle of dressing along with sesame seeds and extra coriander leaves because pretty. Obviously the final thing needs serving with plenty of dressing on the side so everyone can help themselves <—– plenty of dressing = vital to being a good host. If you want more happy salads like this then don’t miss all my other salad recipes! 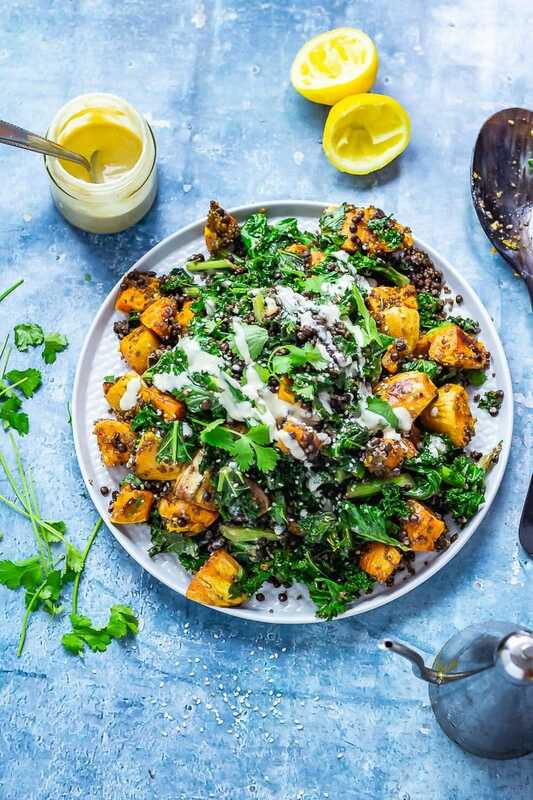 WONDERING WHAT TO DO WITH THE LEFTOVER INGREDIENTS ONCE YOU’VE MADE THIS SWEET POTATO & QUINOA SALAD? 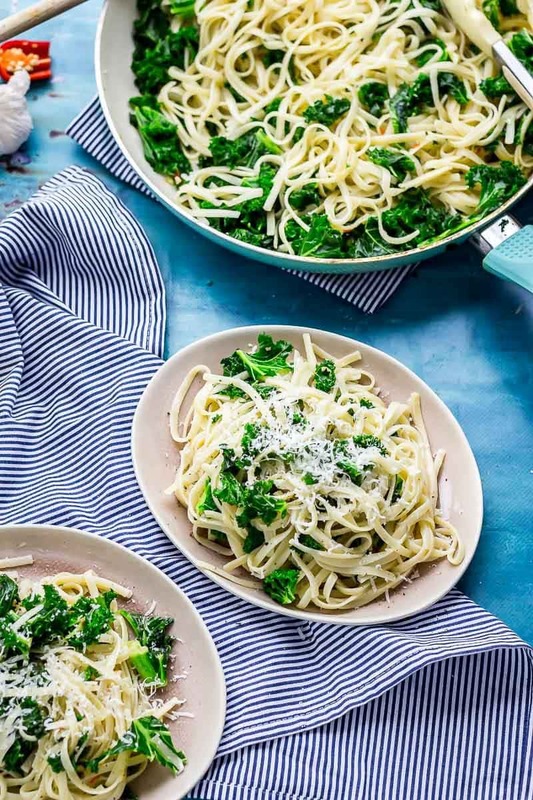 Use up leftover kale in this super simple pasta dish. 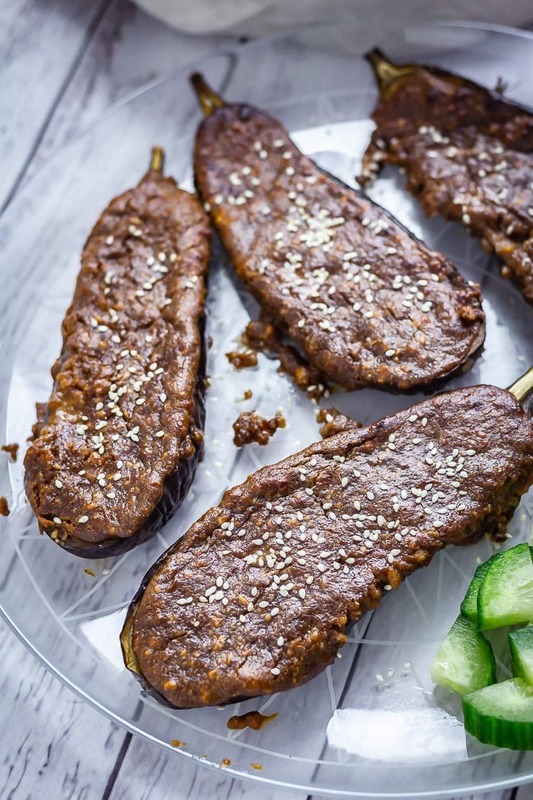 Tahini is one of my favourite ingredients but if you’re not sure how to use it up why don’t you try making these roasted aubergines with a tahini satay sauce! Salads are only worth eating if they're going to fill you up and make you feel amazing. 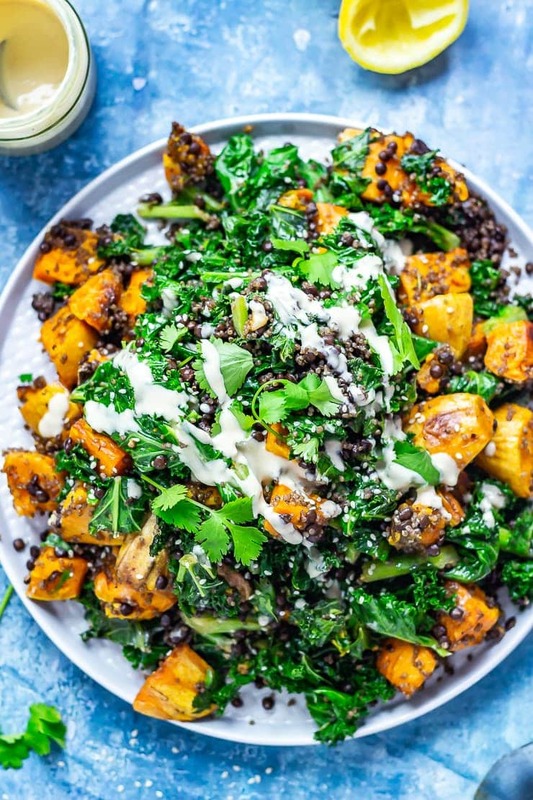 This sweet potato and quinoa salad does exactly that. Drizzle with a good helping of creamy sesame dressing and you've got a perfect lunch or dinner. 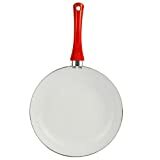 Heat the oven to 200°C/400°F. 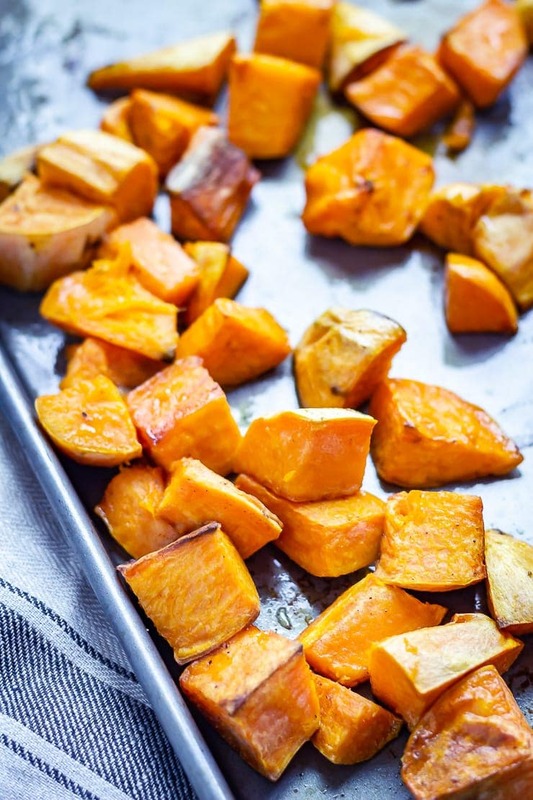 Toss together the sweet potato, olive oil, chilli powder and a sprinkling of salt and pepper on a baking sheet. Place in the oven for 30 minutes until softened. While the potatoes are cooking whisk together the tahini, lemon juice, maple syrup, garlic and a pinch of salt. Add water a few drops at a time until you reach the desired creamy consistency. Saute the kale in a few drops of oil over a medium heat until wilted. 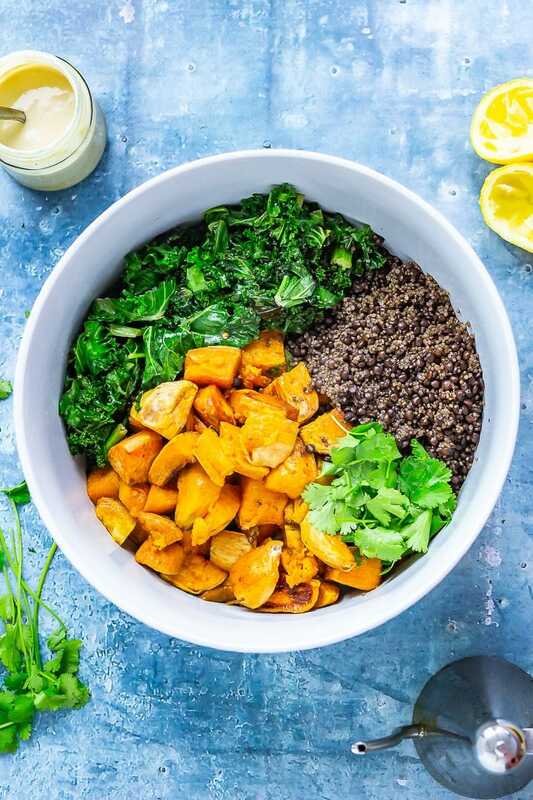 Once the sweet potato is cooked place it in a large bowl with the kale, lentils & quinoa, coriander and a drizzle of dressing. Toss gently and serve with a sprinkling of sesame seeds, extra coriander leaves and more dressing. Those chunks of potato salas look amazing. I love that you have added quinoa for extra protein. Oh My Gosh!!! Amy this recipe has my name all over it! 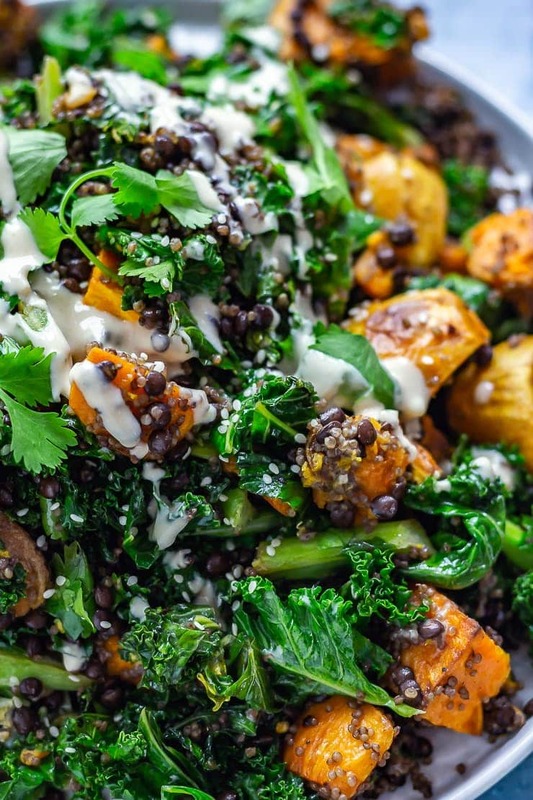 You had me at sweet potato and quinoa but then the tahini and maple dressing has me swooning! Pinning! This. Is. Gorgeous!! Pinned! Loving everything about this salad! This. Looks. SO. Good. 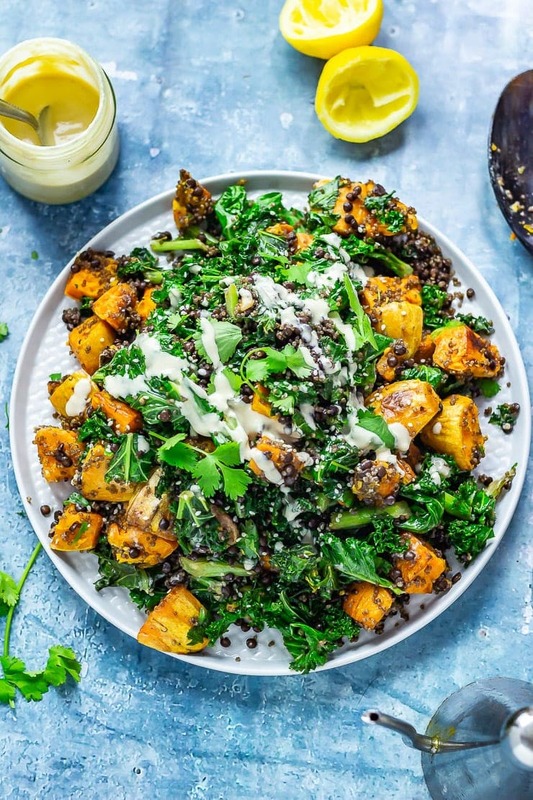 I’m immediately drawn to anything with sweet potatoes, and I love the way you use them in a lighter way with this salad. 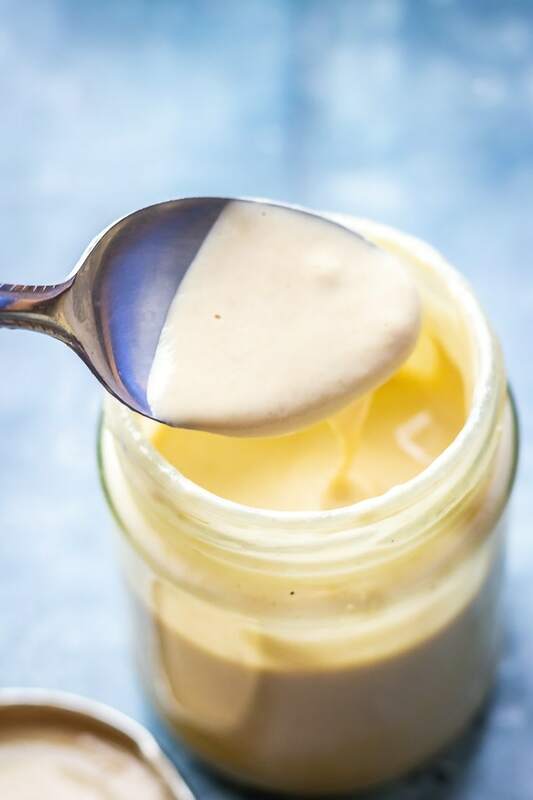 The tahini dressing sounds absolutely heavenly too. Pinned! The salad itself look so good, and the dressing sounds divine! What a great idea. Thanks for sharing!